New Delhi July 13 (IANS) The depth and breadth of collaboration between India and the US ranging from security and economic partnerships to the sharing of talent and culture across areas like science and technology innovation and performing arts have been brought alive through an ongoing photo exhibition here. 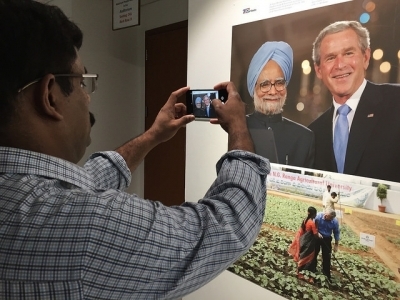 The exhibition which runs through August 14 at the American Center features images and photographs from the US Embassy archives that document the Indo-US relationship as far back as the 1950s. "All around us you will see inspiring images from past and present that reflect the strategic partnership and strong friendship that the United States and India have enjoyed for 70 years now " said Sarah Ziebell US Embassy s Regional Public Engagement Specialist. "Building this exhibition was both a labour of love and a joy for the team that assembled it and we are proud of its reflection of US-India dosti " she said.